Lync Mobile Push Notification Failures Fixed! I just got the e-mail from Microsoft that version 2.0 of Indianapolis News has been released. This version is (more or less) a custom coded version and in no way uses the AppMakr service. 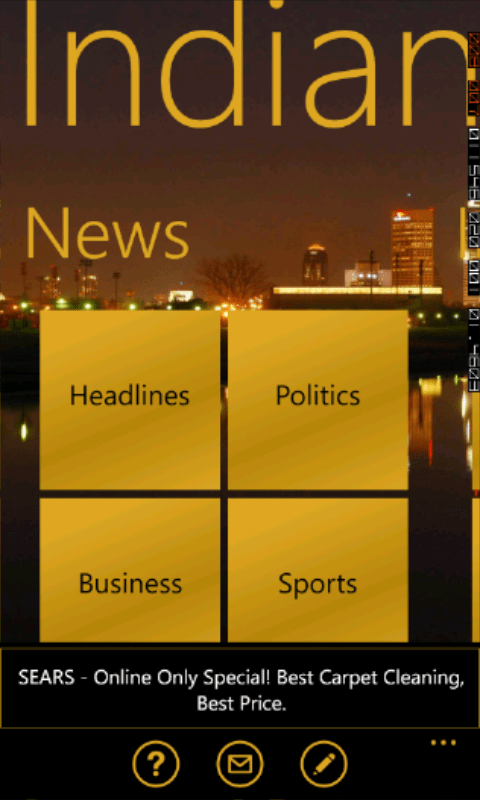 As such Indianapolis News 2.0 now has a full Metro UI and requires Windows Phone 7.1 (i.e. Mango). There will be no version 2 for Android so if you are an Android reader you can quit reading here (or run out and buy a Windows Phone!). The direct link to download the app is right here. There are a ton of new features and the stage is now set to fairly easily add more features in the future. Beyond just changing the GUI, I’ve added a bunch of new news and information feeds. You can track the Twitter feeds of government services like the Department of Public Works and check the daily air quality forecast from Knozone. There are also news feeds for some of the neighborhoods around the city such as Broad Ripple, Carmel, Fishers, etc. Finally, for those completely bored, you can keep up on things like Groupon for Indianapolis, new pictures and videos tagged with Indianapolis on Flickr and Youtube, and seeing the latest crimes committed around this fair city. I have plans to add additional features over time like weather and…uh…other stuff! If you have any recommendations for future additions, please leave a comment below. And for those wondering about an update for Lync News, yes, there will be a 2.0 released in a few weeks with a similar list of features as this one as it’s basically the same code. Quick note: I just submitted version 2.1 of this app. This adds some Super Bowl feeds, a tweak to one of the existig RSS feeds, a small modification to the article summary display and, most noticeably, a new icon. The new icon will now change colors as you change the Theme on your phone. This may be “sacrilege” as you can now make the Indianapolis Flag be all kinds of colors. If I get feedback from people hating it then I will switch back to the “classic” Indianapolis flag for the icon.